I've been traveling through another dimension, a dimension not only of sight and sound, but of mind and touch. A journey into a terrifying land whose boundaries are that of wild nightmares. 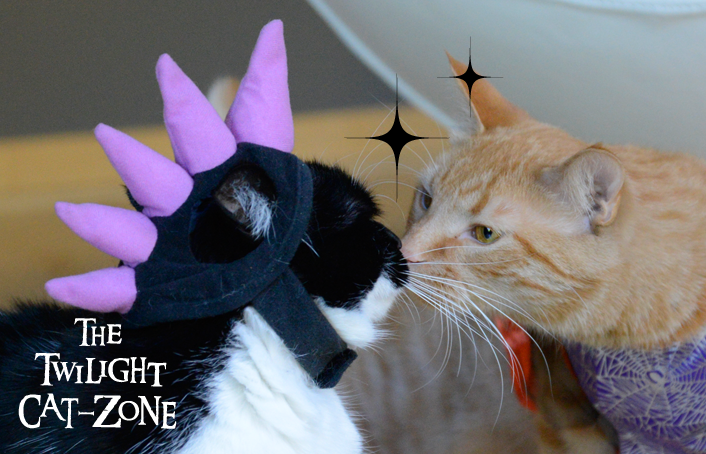 Where unsuspecting cats grow purple horns and furry orange monsters commit unspeakable acts. WAFFLES: Did someone say my acting us unspeakable? KATIE: There's a signpost up ahead. Next stop: The Twilight Cat Zone. WAFFLES: Ok, Boss! Is this where I'm supposed to hum the eerie music? 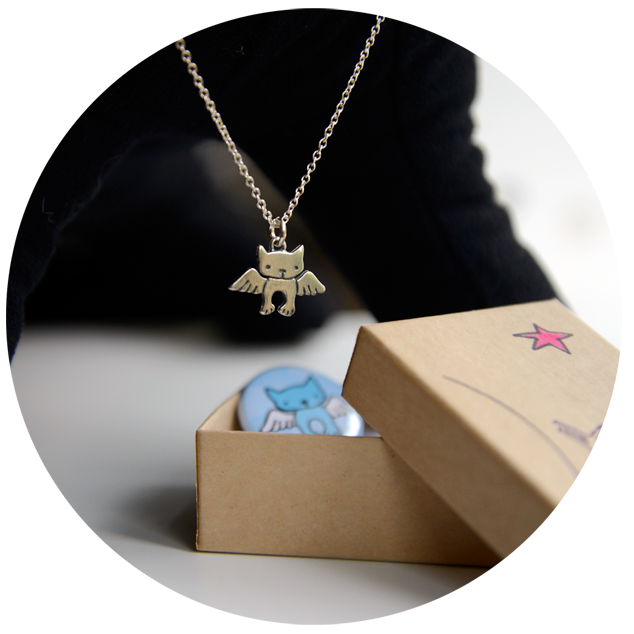 ADORABLE Mark Poulin Jewelry Giveaway! Don't miss out on this gorgeous giveaway. One lucky GLOGIRLY reader will win their choice of any Mark Poulin Jewelry piece, up to a $50 value. This giveaway is open WORLDWIDE! Yay! Enter now through Sunday, September 13 @ 11:59pm EST. You two look marv-o-lous! Always bring a huge smile to my face. Oh Miss Katie!! You make a very fetching dinosaur!! I assure you, it was NOT a kiss. I told you, it was like I was in another dimension. And what you're NOT seeing are the photos taken immediately AFTER that supposed *kiss* thing. Let's just say I have horns and I know how to use them. That last picture of Waffles is SO cute, and did we see a kiss or was it some photoshop at work? It looked like a kiss to us too! Very spooky!!!! OMC, Katie! What is that purple THING on your head??? Did Waffles really kiss Katie????? Is he still alive????? OMC! We think we're in the Twilight Zone too! We must be in the Twilight Zone if the two of you are kissing!!!!!! pee ess - Raz sent you both invitations to join Cat Scouts. Katie! Make sure Waffles doesn't turn into a Katt Zombie! Then you're REALLY in for it! You two look adorable. 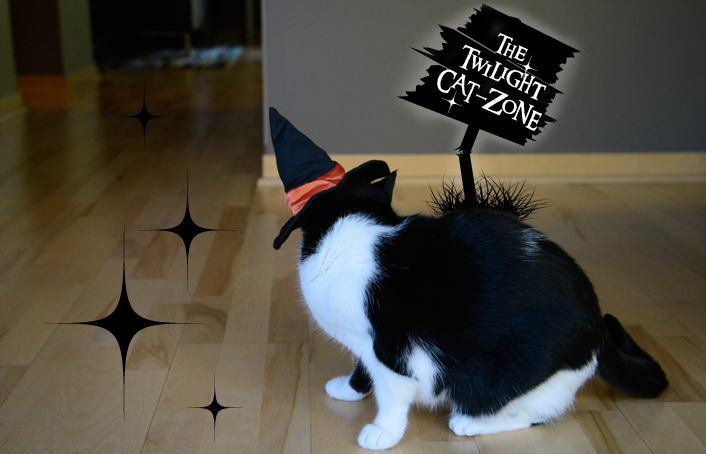 We hope you don't have nightmares from the Twilight Cat Zone. You two are so cute. It must be hard to be eerie and scary when you two are so darned cute! Oh good Katie, I thought it was just me seeing strange things! Did you two really kiss or what??? Cute costumes! I love the one of you two touching noses. 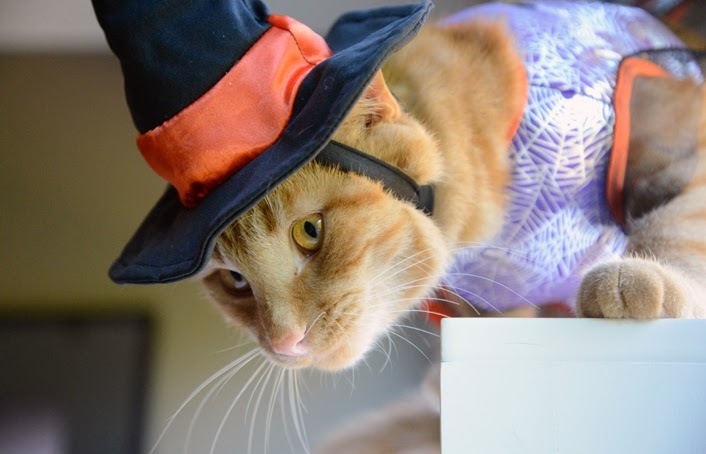 I'm just writing a piece for Petfinders on Halloween costumes and doing limited commenting but had to stop by and ask how long did those hats stay on? OH NO KATIE YOU DIDN'T!!! You let her have her way with you! Lookit those things on your head!! Gasp! Now you did it. I'm beside myself. W@ does look adorable but that's what you have him for. So he can wear embarrassing things and you won't have to. MOL! Is Waffles wearing a dress?... Love the spiky hat, very cool! Did Waffles give you a smooch? Oh, you both look great in your Halloween hats! What did Glogirly have to pay you two to get you to agree to wear those costumes? enjoy de week oh end ! OOOOH, that is some mighty strange (and cute) stuff, indeed! Waffles Wednesday: Uh Oh, Can Glogirly Fly??? 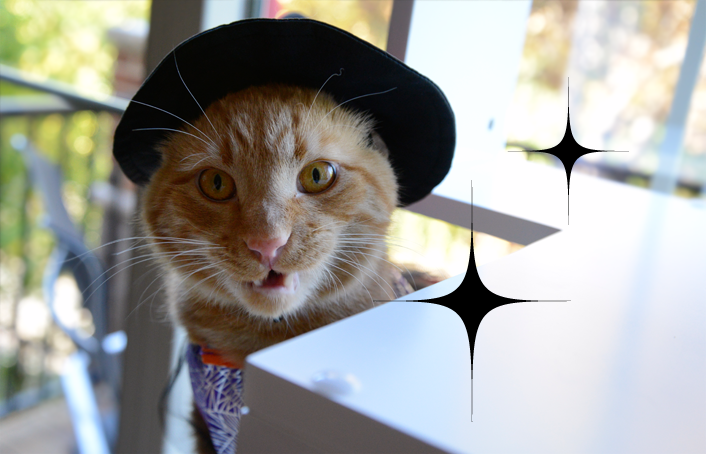 Waffles Wednesday: Ready, Set, Measure! Seven to Ten Days -- Plus Giveaway Winners!